To purchase, email me at tombrownstudio@cox.net. 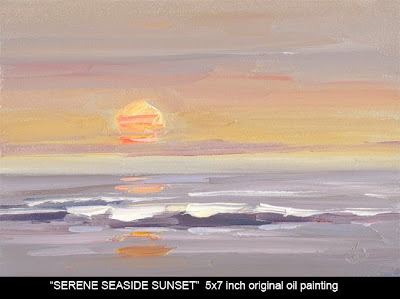 This painting was done just before sunset. I used the laptop-size paintbox shown in my CD on plein air painting. 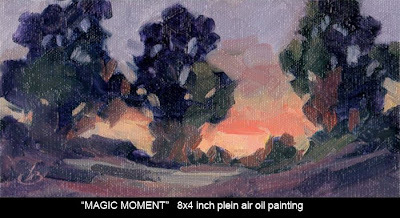 I keep the paintbox in my car at all times for opportunities like this when I need to grab it quick, set up fast and be ready to paint instantly. 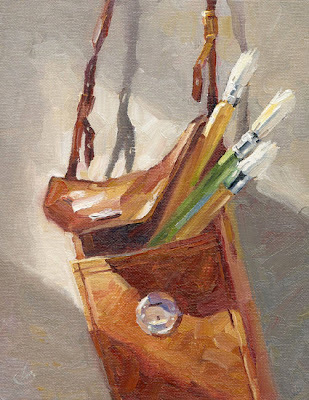 Plein air painting lets you grab the thrill you feel outdoors and capture it in oils. There’s a quality of magic to it that’s hard to describe. It’s a total sensory experience that seems to include the scent of the earth, sounds of birds, the breeze on your face. You bring home that freshness and excitement in your painting. I urge all studio artists to try plein air painting. Your work will take a quantum leap overnight. Email me and I’ll share some free tips on getting started, just like I teach on my TV show. Looking forward to starting a good book. 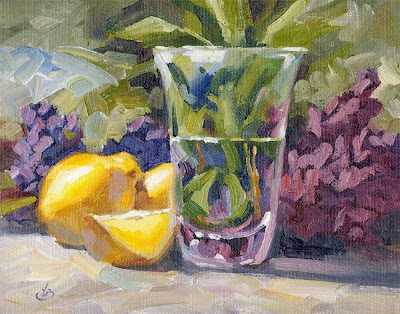 In addition to painting outdoors on location (en plein air) I also greatly enjoy painting interesting still life arrangements in the studio or outdoors in sunlight. I set up this composition in my back yard. 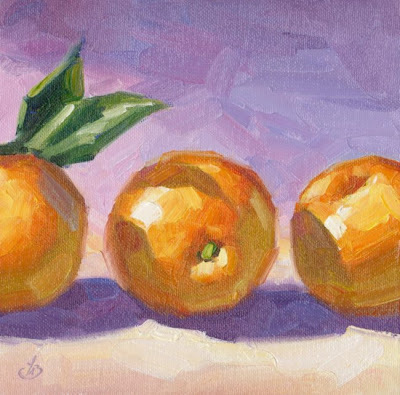 The direct sunlight on the oranges brought out the brilliant colors of the fruit. I always begin a painting by asking myself what made me want to paint the subject and what I want to express about it. In this case, the COLOR is what excited me, and that’s what I wanted to emphasize. Next I ask myself how I can make the ordinary become extraordinary. I felt the bold, free brushwork made this piece come alive. To see what I mean, click the image for a larger view. I was quite pleased with how this piece turned out; hope you like it too. If you would like it on your wall, email me at tombrownstudio@cox.net and we can arrange it. Thanks for looking. Scroll down on my blog to see more paintings. I always begin a painting by asking myself what made me want to paint the subject and what I want to express about it. Then I kick it up a notch by asking how I can make the ordinary become extraordinary. From that point on, it practically paints itself. I just hold onto the brush and go along for the ride. If you’re an artist struggling with your work, I suggest you take your paints outside and make it fun again. Plein air painting offers a refreshing escape from the daily grind. You become totally immersed in the moment and painting feels effortless. It’s pure joy. Your work is sure to improve. 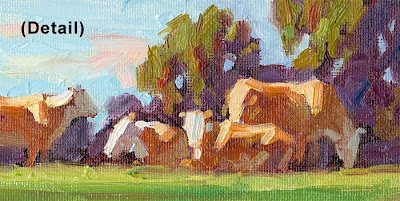 And plein air paintings have an honesty that makes them valuable to galleries and collectors alike. 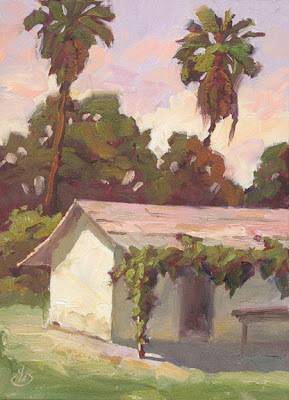 So get outside and explore the fascinating world of plein air painting. You’ll come back home tired but happy. Nothing beats that feeling. Email me and I’ll share some free tips on getting started, just like I teach on my TV show. In addition to painting outdoors on location (en plein air) I also greatly enjoy setting up interesting still life arrangements in the studio. I felt this composition was simple, but dramatic. This famous HOLLYWOOD sign is more than a city’s name. It’s a universal symbol for the place where magic is possible and dreams can come true. 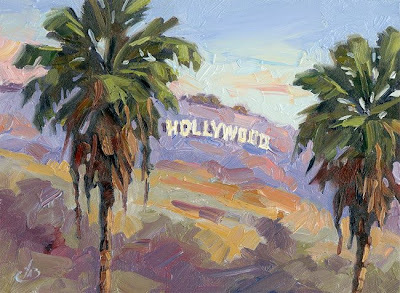 I painted this near Hollywood Blvd and Highland Ave, close to where the academy awards are held. Plein air painting offers a refreshing escape from the daily grind. You become totally immersed in the moment and painting feels effortless. It’s pure joy. 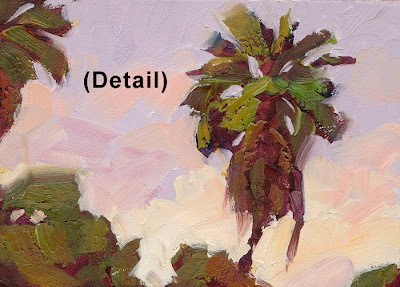 And plein air paintings have an honesty that makes them valuable to galleries and collectors alike. 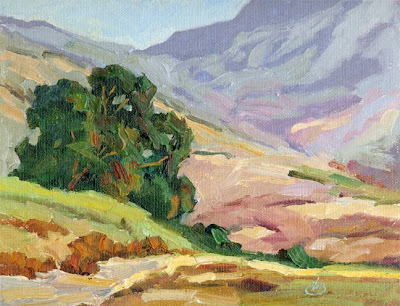 So get outside and explore the fascinating world of plein air painting. You’ll come back home tired but happy. Nothing beats that feeling. 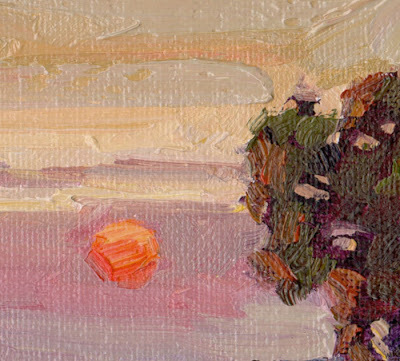 I urge all studio artists to try plein air painting. Your work will take a quantum leap overnight. To get you started I’ve created a CD entitled “PLEIN AIR PAINTING MADE EASY.” It costs just $30 and it’s for the absolute beginner. 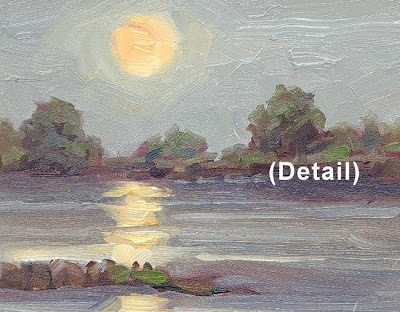 This CD includes everything you need to know to join the fun of outdoor painting: a short supply list, packing tips, alternatives to expensive easels, brushwork, color mixing, and loads more. Including step-by-step demonstrations and comparisons of basic approaches under different outdoor conditions. This CD is an e-book that you use on your computer, or print out for handy reference. Everyone raves about it. Recently I’ve also been able to make 4 of my TV shows available on DVDs. In each video I am filmed live on location painting the scene before us. The cameras follow every step from blank panel to finished painting as I explain everything in detail while I paint. 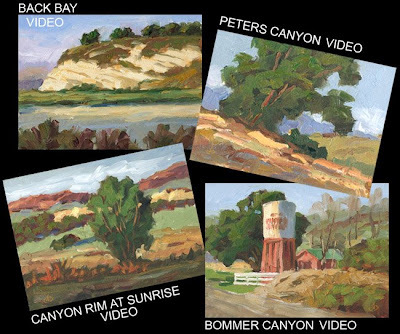 The DVDs cost $30 each and I’m excited about all of them, but if you want to get just one I would suggest “BACK BAY.” In the “BACK BAY” video I show how to make a simple outdoor painting kit that costs nothing. It’s great, because you can try your hand at outdoor painting without wasting lots of money on unnecessary things like a French easel. If you want all 4 DVDs I can give you a discounted price of $100 for the full set. To order CDs or DVDs just email me at tombrownstudio@cox.net. I accept PayPal or personal checks, whichever you prefer. Shipping is free anywhere in the USA. To purchase this painting email me at tombrownstudio@cox.net . To purchase this painting email me at tombrownstudio@cox.net. This is a perfect Father’s Day gift for the golfer in your life. To purchase this painting, email me at tombrownstudio@cox.net. I accept PayPal or personal checks. Shipping is free (I ship to the USA only). Remember the sense of peace you felt relaxing outdoors in the moonlight? The world is quiet. The air is sweet. A gentle breeze cools your face. Memories like those are what I wanted to bring to this painting. If this painting helps you recall those feelings, then I have succeeded. Thank you for taking the time to stop by. If you would like to make this painting yours, email me at tombrownstudio@cox.net. Enjoy your day. Emotional impact in a painting is more important than mere details to me. 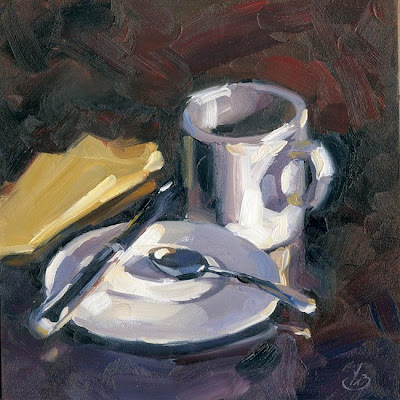 I paint from the heart, and what I wanted to capture in this little gem was simply color and light. I loved the illumination of the honey jar and how the colors of these flowers contrasted with it. This one will add a joyful color note to any wall in your home. 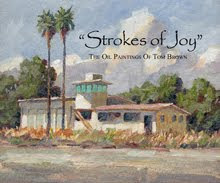 If you simply cannot live without it, email me at tombrownstudio@cox.net. This painting isn’t for sale; it’s a gift for a friend. My friend found this ancient Kodak camera case in an antique store. He mended the handle and polished the worn leather before sending it to me as a surprise gift. I now have the case hanging on my studio wall and thought it would make a nice subject for a painting. Ironically, when I was small my parents had a camera that fit this case. I still remember it well and this brings back wonderful memories for me. When this painting is dry I will ship it to my friend as a thank you. I think he might like it. Have a wonderful day, and don’t forget to make some memories along the way. I was attracted to this scene by the contrast between graceful organic shapes of nature and geometric shapes of man made elements. 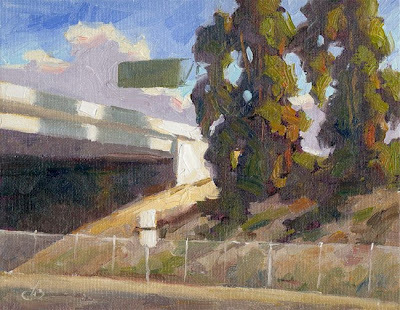 I also liked the soft shadows on the freeway overpass that were cast by the trees, as well as the billowing clouds in the sky. I feel that sometimes we tend to overlook beauty in the commonplace things like this that surround us on a daily basis. Thanks for looking; enjoy the view. Click image of the full painting or detail for a larger view. A neighbor’s peach tree was the inspiration for this one. The tree is loaded with ripe peaches that just beg to be put into a painting or pie. 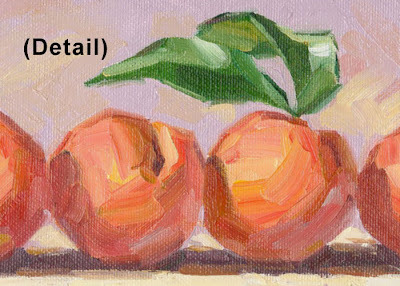 Since I’m a disaster in the kitchen I chose to make a painting with these peaches. Email me at tombrownstudio@cox.net if you have a taste for this one, or if you’re interested in my DVDs or CDs on oil painting. Thanks for stopping to look; have a delicious day. 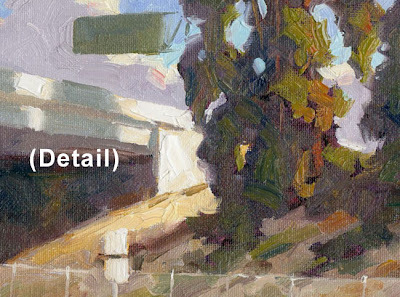 Plein air painting lets you grab the thrill you feel outdoors and capture it in oils. There’s a quality of magic to it that’s hard to describe. It’s a total sensory experience that seems to include the scent of the earth, sounds of birds, the breeze on your face. And that freshness and excitement come through in your paintings. If you’re a studio artist I urge you to try plein air painting. Your work will take a quantum leap overnight. To get you started I’ve created a CD entitled “PLEIN AIR PAINTING MADE EASY.” It costs just $30 and it’s for the absolute beginner. When I approached the caretaker for permission to paint on this property with my students, I was welcomed with a smile and told, “Make it your home.” It was the beginning of another wonderful day. The Montanez Adobe is located in the historic Los Rios district of San Juan Capistrano near the famous mission. It was built in 1794 and is listed on the National Historic Register. Painting on this property was like touching a piece of history. In this painting I was interested in capturing a special quality of light and color. It has to be seen in person to be fully appreciated, but if you click the images for a larger view you will get a better sense of the lush color and brushwork. I liked the idea of using lemons that had a bit of variety, including one lemon that was still a bit green. The green one contrasted nicely with the bright yellow of the other lemons. And the single leaf on one of the stems added interest to this composition. I also enjoyed putting in a single wedge of lemon among the whole lemons. The light filtering through the translucent slice of the lemon wedge made it seem to glow. What do you think? If you’d like to own this one, email me at tombrownstudio@cox.net. 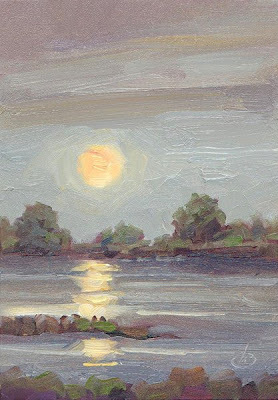 In this painting I particularly wanted to capture the soft colors and tones of the early evening as the moon was rising. I wish the computer monitor could properly capture the subtle nuances in this piece. It has to be seen in person to be fully appreciated, but I wanted to share this with you anyway. This is another of my personal favorites. Click the images for a larger view. Email me at tombrownstudio@cox.net if you would like to buy this painting or if you’re interested in DVDs of my art instruction TV shows or my art CDs. (By the way, thanks to everyone for the kind comments about my recent DVDs. Glad you like them!) Thanks for stopping to look. 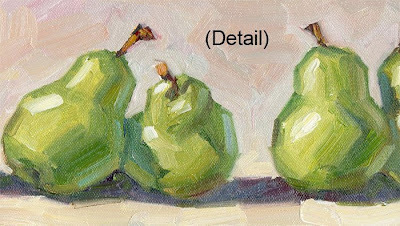 I hope you’re enjoying my “long horizontal” still life paintings as much as I enjoy painting them. They have a very contemporary look and fit well with any decor. 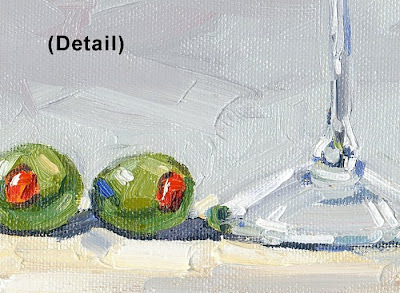 Click the images for a larger view, and check the “detail” image to see the loads of juicy, rich color and brushwork! Email me at tombrownstudio@cox.net if you have a taste for this one, or if you’re interested in DVDs of my art instruction TV shows or my art CDs. (By the way, thanks to everyone for the kind comments about my recent DVDs. Glad you like them!) Thanks for stopping to look. 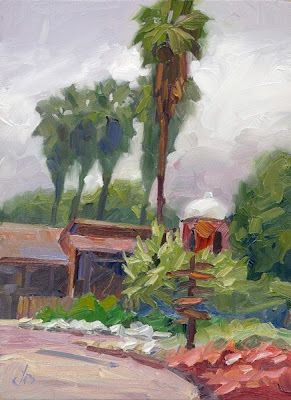 Just after completing this painting on location in San Juan Capistrano I met Huell Howser, who was filming a segment of his TV program "California Gold." 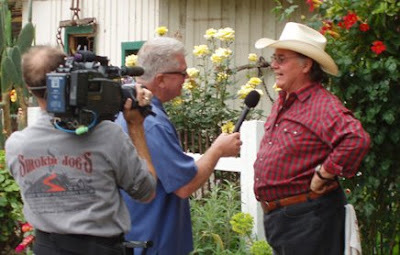 Here is a photo I shot as Huell was interviewing Stephen M. Rios during the show. We were on historic Los Rios Street, which was named for Stephen‘s great-great grandfather. The Rios Adobe (shown in the background here) is the oldest continuously occupied residence in California and it has been occupied by the descendents of the original family for over 200 years. It was a memorable morning. Plein air painting is so easy if you just don’t make it hard. 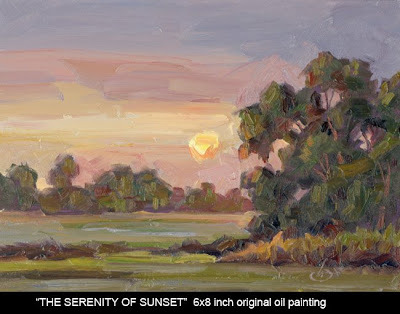 To capture the fleeting color and light in this sunset I used streamlined equipment that let me set up and begin painting in a matter of moments. That was important. My approach to the subject was equally important, letting me get into the zone immediately and follow my muse. Recording a sunset leaves no time to falter, but it’s easier than you might think if you do it right. Much advice about plein air painting that is given to artists in magazines and books is wrong, however. There are easier ways to approach it than I often see published. If you want to have fun and paint well, find someone who already does that. Then copy their methods and make them your own. That’s how I teach in my workshops and on my TV show. If you can find a good workshop instructor who teaches plein air painting in your area, I suggest you enroll in some workshops. There’s nothing like live instruction. The next best thing is to get videos and follow along at home until you get a feel for it. Then you can venture out with confidence. Recently I’ve been able to make 4 of my TV shows available on DVDs. The response has been overwhelming and I’m happy to be able to help so many artists get off to a good strong start with plein air painting. If you want all 4 DVDs I can give you a discounted price of $100 for the full set. To order just email me at tombrownstudio@cox.net. I accept PayPal or personal checks, whichever you prefer. Shipping is free anywhere in the USA. Whether you try it on your own, with me, or with another instructor I encourage you to give it a try. You’ll be glad you did. Happy painting! Sunsets; each is completely unique. Parrots were making a racket outside my window as I packed for the plein air class where I did this painting. Parrots are really loud, did you know that? But they’re beautiful, especially when sitting on palm fronds in the morning sunlight. I used to live in the Midwest, and I enjoyed painting outdoors there also. But I prefer Southern California. It’s truly a paradise, with scenery and color like this. Putting emotion into your painting is what I feel plein air painting is all about. And capturing a true sense of the place. That’s something you can’t get in the studio. When you try it you will realize there is nothing like the thrill of coming home with a painting that actually shows what you saw and felt that day! But back to painting. A strong painting starts in your head, not on canvas. And here I showed my students how to clearly identify what you want to express on canvas before picking up your brush. For example I wanted to capture the panoramic grandeur of this scene, so I chose this long horizontal panel from among an assortment I had with me. I also showed everyone how to draw attention to the “keyhole,” a unique opening formed by erosion in the base of the cliffs. To draw the eye to the keyhole formation I showed how we could view the scene from a vantage point where a strong contrast in light and dark values would naturally attract the eye. And I demonstrated how to anchor this dark and light pattern during the initial sketch while the idea was fresh. 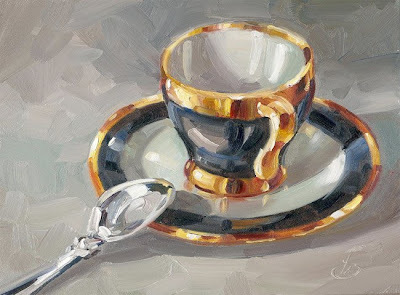 Once we all had a good start on our canvases I continued helping everyone by explaining recipes for effective color mixtures, how to use the brush differently for various effects, when to use thick or thin paints and why, plus lots of other things. One of the students suggested I should call my workshops “Plein Air Painting for Dummies,” because I make everything so easy. It IS fun and easy if someone shows you what to do. That’s what I do for my students, and it’s probably the reason my workshops are always full of happy painters. In fact this is what has made my TV show catch on so quickly. I explain everything you need to know, from how to lay out your paints to how to hold the brush. I tell all my secrets, tips and techniques. Recently I’ve been able to make 4 of these TV shows available on DVDs. The response has been overwhelming and I’m happy to be able to help so many artists get off to a good strong start with plein air painting. If you are an artist I strongly urge you to try painting outdoors directly from nature. You’ll bring home valuable memories from every outing and you’ll be glad you tried it. There is nothing like the experience of painting outdoors directly from nature. In the videos of my TV shows I share the secrets, tips and techniques of how I paint on location. In the “Back Bay” video I use a special outdoor painting kit that doesn’t cost a cent. It’s perfect for a first-time outdoor painter because it eliminates the need for costly equipment like French easels or other specialized gear. Each video shows a demonstration painted entirely on location and filmed in real time as I develop the picture from a blank panel to a finished oil painting. It’s the next best thing to being on location with me! I couldn’t resist doing a quick study of this when it caught my eye. 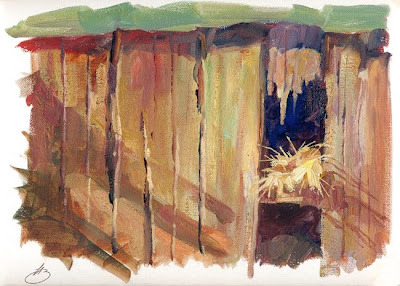 In the side of an abandoned barn a bird’s nest was snugly nestled into a small opening between splintered boards. I was interested in the contrast between the delicate texture of the nest and the weathered barn wood. Slanting shadows called attention to the placement of the nest in the side of the barn and accentuated the fragility of the nest. Since this was merely intended as a study to capture the moment, the edges of the canvas are not completely painted. But I thought this was such a charming piece I wanted to share it with you. Email me at tombrownstudio@cox.net if you wish to buy it. There is nothing like the experience of painting outdoors directly from nature. In my TV shows I share all the secrets, tips and techniques of how I paint on location. And these shows are now available on DVD. Each video shows a demonstration painted entirely out on location and filmed in real time as I develop the picture from a blank panel to a finished oil painting. It’s like being on location with me! For a limited time you can get a full set of 4 shows on DVDs for just $100. This set includes the special show where I demonstrate an outdoor painting kit that doesn’t cost a cent. It’s perfect for the beginning plein air painter because it lets you try your hand at working outdoors without investing in any special equipment.